Browse our incredible selection of handmade global area rugs. Find a variety of low and high piles, textures and designs for the kitchen, living room and outdoors. 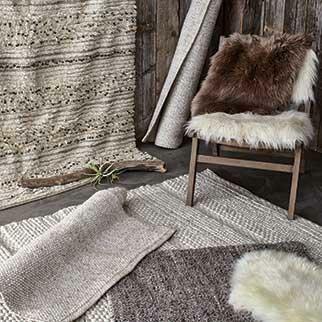 Add softness underfoot with our wide selection of modern wool area rugs. Discover tufted, flatweave or flokati wool rugs and bring home a unique piece. Crafted of eco-conscious materials like hemp and jute, our natural fiber rugs add freshness and style in a variety of vibrant colors and designs. Solid hued window panels and curtains accentuate any room in the home and we've got an abundance of bold or classic colors and chic fabrics. Add softness and style to any room with our sheer curtains. Layer with window panels or decorate a canopy bed for sheer breeziness. Brighten your room with patterned and striped curtains. Choose from soft cotton, jute and linen fabrics in vibrant designs for a well-dressed window. 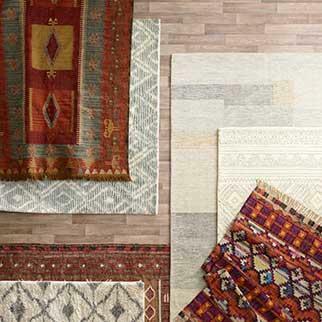 Add new life to your home with our spectacular array of area rugs and window coverings. 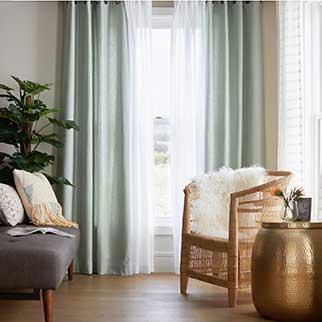 Visit a store near you to discover high quality, affordable curtain panels and window treatments for every home decor setting. Coordinate your new draperies with our wide selection of artisan floor coverings ranging from traditional Persian-style carpets to ultra-modern area rugs. World Market has been the destination of choice for unique floor tapestries for more than 50 years. 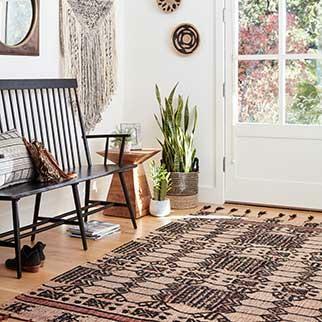 Our handpicked selection of indoor rugs includes reclaimed cotton chindi rugs, plush 100% wool rugs and natural fiber rugs made of jute, hemp or bamboo. We offer rugs in 2' x 3', 3' x 5', 4' x 6', 5' x 8', 6' x 9', 8' x 10', round and square sizes - if you can't find it in-store, you'll definitely find it online. Our selection extends to long runners for the hallway and coconut husk doormats for the entryway or mudroom. Our resilient, budget-friendly outdoor rugs feature vibrant colors to brighten your patio. Our reversible indoor-outdoor Rio floor mats and picnic blankets are popular for their affordability, portability and range of chic designs. Our hand-knotted, hand-woven and hand-tufted area rugs feature styles ranging from traditional and vintage-inspired to modern and contemporary. We make it easy to find the right flooring covering for tile, hardwood and carpeted spaces. Blue, natural, gray, white, brown, black, green, orange, red, yellow and pink are some of the most requested area rug colors available in our selection. Add an authentic work of art to your living room with a one-of-a-kind Turkish rug, handcrafted in the mid-20th century by skilled artisans and lightly restored. We recommend placing our slip-resistant rug pad under any of our area rugs for safety and floor protection. We have your windows covered as well as your floors with sheer and solid curtain panels and the curtain hardware you need to hang them, including curtain rods and curtain rings. Choose from 108", 96" and 84" long panels with grommet tops, sleevetops, tab tops and concealed tab tops. 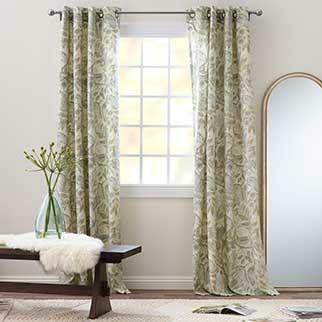 Our single-color curtain sets offer an understated appeal for easy coordination and excellent privacy. Use our blackout shades to eliminate glare in the entertainment den or man cave. 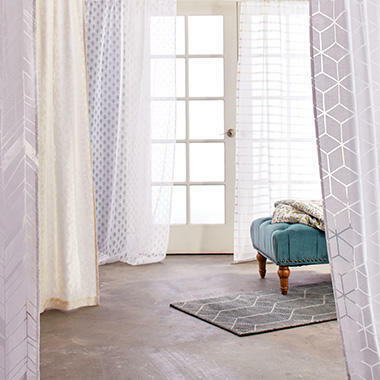 Our sheer and burnout drapes are ideal for filtering sunlight in the living room or adding a touch of softness. Our lightweight crinkle cotton voile drapes are perfect for adding texture. Crushed velvet or silk dupioni curtains elevate any space with a high-end look that remains affordable. 100% cotton, jute, linen and sateen panels are also on offer, both lined and unlined. Mix and match curtains in a plethora of colors and designs for an eclectic effect, or coordinate with your area rugs and home furnishings for a unified look. Drapes dressed up with our exclusive ikat, geometric, floral, ogee and paisley prints represent the chic multicolor designs on offer, and our remarkable outdoor curtains are an easy way to transform the look of your patio or gazebo.